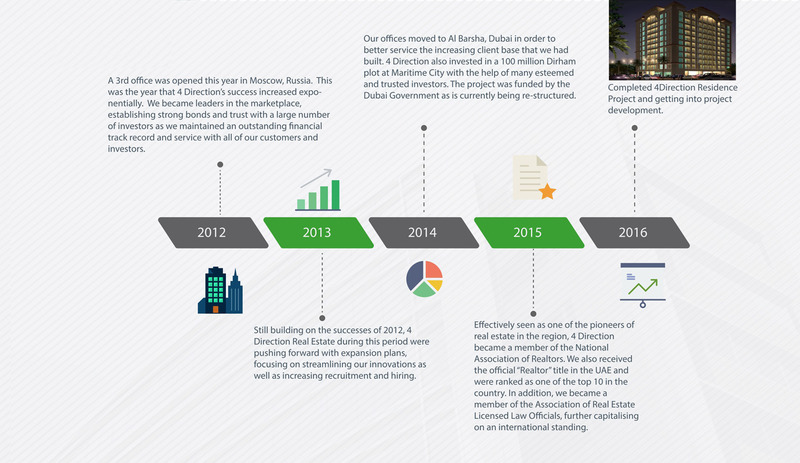 4 Direction Real Estate was founded with a lasting vision in mind, to bring to the table a company that encompasses everything that a stable property company in the UAE should represent. Supported by H.H Sheikh Mohammed Bin Rashid Al Maktoum, Ruler of the Dubai and Vice President of the UAE, 4 Direction Real Estate is truly a real estate company designed to integrate with the future vision of the UAE and its rulers. In our every inner working, we aim to involve a level of integrity that cannot be replicated by other parties in our industry. Our unique approach of putting consumer relation management at the forefront of our approach has allowed us to earn the respect and appreciation from some of the region’s largest investors and contactors. At 4 Direction, our list of services is extensive as we cater to many different aspects from the property market, including property management, marketing, maintenance, development and many others.